Day 6 of my Japan trip would begin in Shirakawa-go (白川郷) and end in Kanazawa (金沢). We started the day fairly early with a traditional Japanese breakfast served in our room at Sumiyoshi Ryokan. Traditional Japanese breakfast featuring baked miso and grilled salmon. This was my most memorable breakfast in Japan, every dish was prepared with care and tasted sublime. The baked miso served on a magnolia leaf was definitely the star of the meal, it’s sweet umami flavour paired perfectly with the soft rice. After our meal, we quickly packed up and headed downstairs to check out. To our surprise and delight, the owners presented us with a pair of lacquered chopsticks as a parting gift. Shirakawago vending machine at the bus stop. With our luggage in tow, T and I made our way to the Takayama bus stop. We had already reserved our bus tickets to Shirakawa-go and would be catching the 11:25am Nohi Bus. Chow Tips: The Nohi bus requires reservation at certain times, head to their English website for more details here. After a scenic 50 minutes, we had arrived in Shirakawa-go. You might be wondering why did we travel to a small, traditional village? 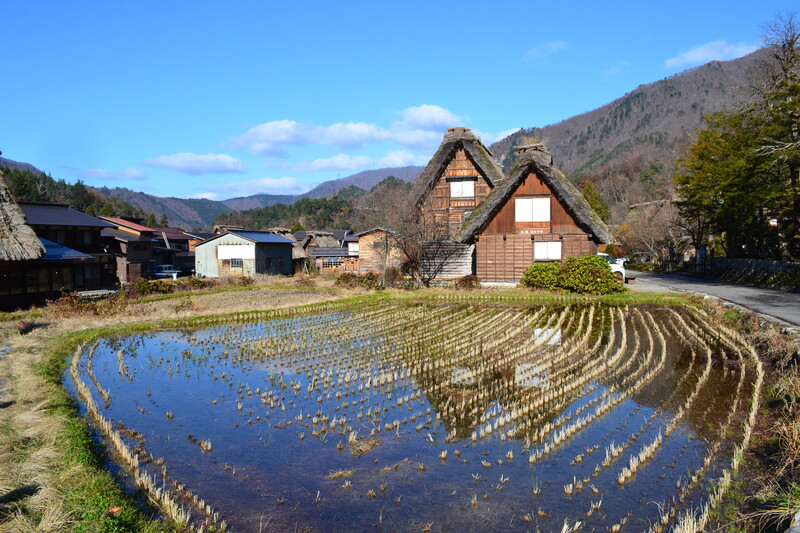 Well, it’s because Shirakawa-go is an UNESCO World Heritage Site, famous for it’s thatched houses called gassho-zukuri (合掌造). After leaving our luggage at the coin lockers, which are conveniently located at the bus station/tourist office, we started to wander the streets of this quaint town. One of the main attractions at Shirakawa-go is Wada House, a gassho style house that’s been turned into a museum allowing visitors to experience life during the Edo period. There’s a small admission fee and you will need to take your shoes off (slippers are provided) to enter. The other must see attraction in Shirakawa-go is the Ogimachi Castle Observation Deck, which is perched on the side of a hill offering sweeping vistas of the village below. Getting to the vantage point is fairly easy as it’s a short 20 minute walk from the village, there’s also a shuttle bus service available. T and I slowly made our way back to the bus station to pick up our luggage and waited for our bus to Kanazawa which was leaving at 4:25pm. After 1.5 hours, the bus pulled into Kanazawa Nohi Bus station which was fortunately only a 5 minute walk to our hotel. As we were only staying for 1 night we booked a double bed room at the Kanazawa Manten hotel for a bargain price of A$60. The only catch was the “double bed” ended up being more like a single bed which meant it was a tight squeeze for the two of us! Dinner was decided courtesy of a quick Google search and we ended up at a nearby seafood restaurant called Uosen (魚せん広岡) that served an extensive menu including sushi, sashimi and grilled seafood. Like most restaurant in Japan, quality ingredients were used and great care was taken in preparing the dishes, the only downside was the restaurant allowed patrons to smoke inside. After a very filling meal, we decided to retire to the hotel as we had planned a very packed day 7 in Kanazawa. Follow me on Instagram for more culinary adventures!